On the afternoon of Christmas Day 1896, Doctor Hoeltge and his sister, Mrs. Augusta Schultze, went out for a ride from Linn and Wade in a buggy pulled by his new and spirited horse. They had reached Vine Street and Clifton Avenue about 2:30 p.m. and, while crossing the street, one of the horse’s shoes became stuck in the cable slot and the animal fell to the street. Two young men came to assist the elderly doctor, but when they unhitched the horse, the horse started to back and turned the vehicle over against a telegraph pole, throwing out both occupants. Dr. Hoeltge was thrown against the pole and was seriously injured about the head. Mrs. Schultze sustained a slight bruise of the nose. The horse bolted down Vine Street toward McMicken Avenue. Patrolman Klusman was standing on the rear platform of the Vine Street cable car on his way to report for duty at the Bremen Street Station. He saw the horse coming down Vine Street at breakneck speed. There were hundreds of men, women, and children in the path of the horse. At 2:45 p.m. Patrolman Klusman leapt from the car, put himself in front of the horse and tried to spook the horse by waving his arms. The horse knocked the patrolman down and seemingly trampled him with every hoof. When the dust had cleared, Patrolman Klusman’s body was face down in a pile of granite blocks. His helmet was in the gutter and his blood staining the pavement. Many willing hands were upon him and carried him to Greyer’s drug store where they called for Patrol 3. Contrary to all the evidence, they hoped he was still alive. He was pronounced dead upon arrival at the City Hospital. Patrolman Klusman was survived by his wife, Mary Klusman (31), and five children including; Helen M. Klusman (7), Edward Louis Klusman (5), Ethel M. Klusman (2), and Elmer J. Klusman (10 months). When Sergeant Love went to their Walnut Hills home to notify his wife, he found the children playing on the floor with their new Christmas toys and lost the nerve to tell her. Instead, he helped her ready herself to go to the hospital, but on the way a newspaper reporter told her of his death. Funeral services were conducted at his home on Cinnamon Street, Obryonville by Rev. Hugo Eisenlohr of the St. Johns German Protestant Church. Pall bearers were Patrolmen Convers, Lowenstein, Hale, and Bernhardt from the Police Department and Messrs. Fisher, Carroll, Condorf, and Weinburg of the Yeatman’s Masonic Lodge. Patrolman Klusman was then taken to and buried in the German Protestant (Vine Street Hill) Cemetery after a military ceremony. Mary died 28 years later. This was not Patrolman Klusman’s first act of meritorious conduct. His name was first scrolled on the Roll of Honor on January 29, 1887. He was recognized as the go-to guy at the Bremen Street Station when something dangerous had to be done. On January 2, 1897, Patrolman Klusman was posthumously awarded the Henshaw Medal for Valor – one of only five such medals ever awarded. It was presented to his seven-year-old son, Louis Edward Klusman. More than 20,000 citizens attended the ceremonies. The medal is now on display at the Greater Cincinnati Police Museum. If you have information, artifacts, archives, or images regarding this officer or incident, please contact the Greater Cincinanti Police Museum at memorial@police-museum.org. This narrative was revised on September 15, 2012, by Cincinnati Police Lieutenant Stephen R. Kramer (Retired), Greater Cincinnati Police Historical Society President,with information provided by the officer’s great grandson, Mark Klusman and research provided by Cincinnati Homicide Detective Edward W. Zieverink III (Retired), Greater Cincinnati Museum Historian. 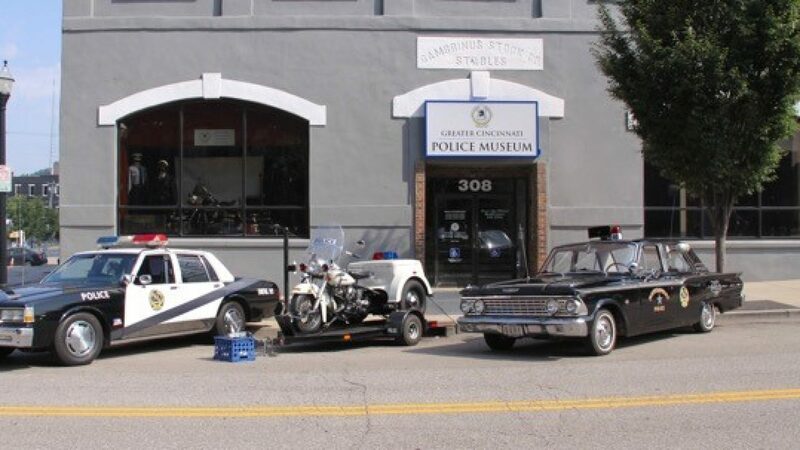 All rights are reserved to them and the Greater Cincinnati Police Historical Society.